Tuesday night, both Mike and I were so happy to be home and we really missed the kids. But, the annual anniversary trip is a must for us (I think every marriage could benefit from it). It’s such a great opportunity to re-connect, to flirt, be silly, be spontaneous, and be relaxed with your spouse. We started these trips on our first anniversary (instead of buying each other gifts) and have not missed one in twenty years. They haven’t always been elaborate, but they have all been adventures. I’m glad we started this tradition – they have become more meaningful as our lives have become more complicated and busy. But, after the “welcome home”, reality began to set in. After being in airports/planes for 14 hours on Tuesday and coming home to the greetings, hugs and kisses (at 9pm), real life started invading already. I didn’t even have time to enjoy the after-glow of my awesome wine country vacation. I wanted to go back in time when I was longing to see my munchkins and envisioning them running toward me greeting me with big smiles, hugs and kisses. . . . . . . .. And, then the kids would go straight up to bed (with smiles) because it was a school night…… And, the house would be sparkling and straightened up because my children would have anticipated how tired I would be. Aaaahh…. Oh, wait, did I start daydreaming again? Sorry about that! I think I’m suffering from PVRL (post vacation real life). For some reason, I’m having a lot of trouble making the transition from this vacation back to real life. It was so relaxing – we didn’t have to be anywhere at any time. We were livin’ free and easy and acting like we had money to spend. It was so fun! 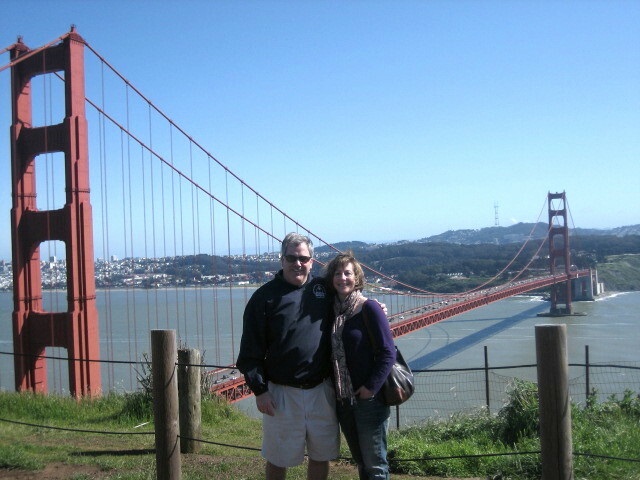 Mike and I were even speculating about retiring in Sausalito (and we are die-hard mid-westerners)! Now, it’s back to work, schedules, taxi duty, etc. There has been no time to ease into it. We both had to work the next day, my daughter had a piano lesson and soccer practice and my son had an Orff concert. Laundry has been calling, bills need paying, the house needs straightening. . . . . . .I’m coming! I’M COMING! This entry was posted in Everyday Life, Parenthood and tagged california, post-vacation, post-vacation depression, postaweek2011, real life, reality, vacation, vacations. Bookmark the permalink. I completely agree with the support group suggestion! I checked out your blog – it’s really great! Good luck with your book! Actually, not really. It’s not that he isn’t capable of making decisions, it’s habit for them to ask me first because I’m the one that’s home more.